Designer frames may help you look good, but the lenses are what allow you to see well. There are many options to make your lenses lighter weight, non-glare, bifocals without any lines, computer-use designs, transitions that offer sun protection when activated, and different material options that have crisper, clearer optics to give you not only the most optimal vision but also the most cosmetically-pleasing eyewear available anywhere. Our philosophy when prescribing glasses is to educate you on the differences in design and quality of lenses available. Superior quality lenses are typically available through large labs and cannot be made in just a couple of hours. Some commercial stores offer lenses in an hour or so, but you must understand that you are not receiving the best quality lenses available on the market. We use these larger labs to ensure the best quality lenses. You will not receive these lenses in one hour, but we believe the wait is well worth it. Varilux S 4D – eliminates swim, allows your eyes to work together, personalizes the lens to your facial features and provides the ability to focus faster for the ultimate in lens personalization. 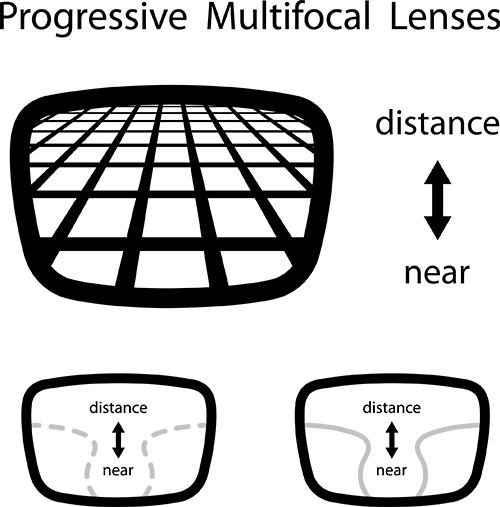 Progressive lenses are perfect for you if you need help seeing up close, far away, or in between. These progressive lenses have no lines with a smooth transition between parts with different focal lengths, correcting for vision at all distances. New Lens Technology: New products and testing methods are being developed all the time. The doctors at Alpharetta Eye Clinic and Windward Eye Care keep up with all the latest technology. They update their skills and knowledge regularly so their patients benefit. Call one of our Alpharetta, GA, locations today to make an appointment for an eye exam. Make your eyes a priority.